With so many new changes to Modern recently, every assumption we’ve previously held regarding the format as we know it is suspect to change. Mono-Green Stompy is back, Zur the Enchanter is finally poised to take the format by storm, so prepare yourself for Vexing Devil mirror matches every third round. Now that we’re all awake, hi, how’s it going. I’m Trevor, I work here. No, for the most part the good cards in Modern will stay good, but under the surface, things have changed. Archetypes that were once strong will find their value diminished, and strategies that were once held in check could suddenly find themselves unshackled from the bonds of the “rogue” denomination. We’ve talked about what the new Modern landscape could look like for the past couple weeks, but the time for conjecture and speculation has passed. Results are rolling in, and by now most of the SCG Regionals data is available. In preparation for analysis on larger scale, today we’ll be diving into what this new Modern is starting to look like. It’s decklist time. Cheeri0s has been the “mini-Eggs” deck of choice on the fringe of the format for as long as I can remember. The strategy is simple; play Puresteel Paladin, dump your hand, chain as many eggs onto the battlefield as possible, Retract with a Mox Opal (or Paradise Mantle in a pinch) and repeat. Draw to your Grapeshot and win. 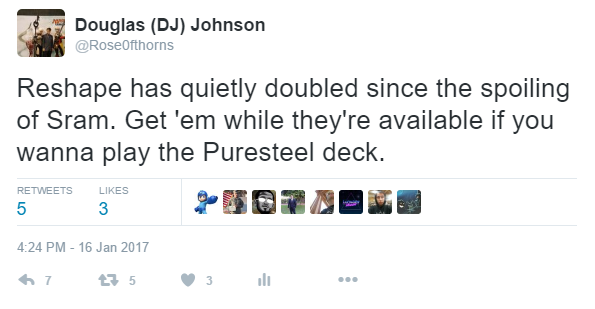 The deck loses to removal and does nothing without Puresteel Paladin…until now. Sram, Senior Edificer gives us 4 more copies of our best card, to the point where we’re starting to approach something resembling consistency. When things are working, we’re casting Puresteel Paladin or Sram, Senior Edificer on turn two, and immediately dropping every egg we have in hand in search for a copy of both Retract and Paradise Mantle/Mox Opal. We can win on turn two. Often. In Modern. In a turn-four format. This is assuming our opponent plays along, of course. Lightning Bolt at the ready ruins our day, but assuming our opponent doesn’t have it immediately we can equip either of our Shields to put us out of range. Of course, we can always slow down a bit to protect our guy with Swan Song or Silence out of the sideboard, and Silence in particular is a great way to pressure our opponent with just the threat of killing them through all resistance. When they know we have it, they can’t afford to play slow, which often means they’re tapping out when they have pieces of interaction in hand because they feel the need to apply pressure. That’s the sort of “free value” that comes with being priced into playing a particular way (think keeping in removal against the Gurmag Angler/Dispel control deck). Bastion Inventor seems to be the go-to “panic mode” option of choice for when things go badly (e.g. Stony Silence). Stony Silence doesn’t stop the Paladin/Edificer triggers, or Paradise Mantle if it’s already equipped, but it does stop Mox Opal. This makes it a poor option to fight us, but they will probably still play it against us. The good combo decks (and we are a combo deck) by nature invalidate a lot of our opponent’s normal methods of interaction. They’ll be scrambling for stuff to bring in, and, “kill Mox Opal, turn our Lightning Bolt back on,” is good enough for two mana. Back to Bastion Inventor, a 4/4 hexproof seems poor in a Tarmogoyf format, but we have Bone Saw! How lucky for us. A Bone Saw and Accorder’s Shield to push us over their 4/5 sounds delicious—just watch out for Liliana of the Veil! Which, of course, is where Leyline of Sanctity comes in. I’m bringing this in against every black deck, and against Burn and Ad Nauseam (though we should be much, much faster that Ad Nauseam). Overall, Cheeri0s gained four more copies of its best card, and a solid sideboard option to attack from an alternate angle. I still feel like this deck is fragile, and can just whiff sometimes, but the power level has definitely been kicked up a notch post-Aether Revolt. It’s time to start getting some matches in against this thing—you will face it sooner or later. Splinter Twin is back baby! But it’s worse, and not Splinter Twin, which is why you see random things like Spreading Seas and Pia and Kiran Nalaar in place. Not being able to combo at instant speed is a good thing for the format, but absolutely horrible for us. As a result, we’re torn between going Wall of Omens, Saheeli Rai, Felidar Guardian or actually holding up mana for the other half of our deck, which is at odds with all these sorcery-speed threats. Now, I’m not dismissing this deck just because you can’t end-step Deceiver Exarch, I’m just tempering expectations a bit by bringing to light the fact that this strategy will feel clunky at times. The good news is that the core of this archetype is strong enough that it can play around 8 cards short and function relatively well. We saw it before with Splinter Twin and it remains true here: Snapcaster Mage plus counterspells/removal are strong enough that we can hold opponents at bay long enough to find either our missing pieces or protection to go off. The bad news, however, is that with no combo piece on the field, along with the knowledge that it takes two full turns to get there (until we have seven mana) our opponent can play as fast as they wish until we drop half of our combo. At that point they’ve got enough warning to switch gears. This might sound minor, but a lot of the strength of Twin came from the fact that opponents were forced into playing slow, lest they just died on the spot. As anyone familiar with that archetype can attest to, more games are won based on the threat of the combo than the actual combo itself. Not having access to that here really hurts our strategy. Still, the core is solid, and the combo pieces are serviceable. Saheeli Rai does just enough for three mana to be fine on her own (think copying Snapcaster Mage to gain a Lightning Bolt or Serum Visions) to the point where I’m not groaning when this card is in my hand. That in and of itself is actually better than Splinter Twin, which did absolutely nothing until it won the game for you. That’s definitely worth more than I’m giving it credit for, so keep that in mind. This deck can play better than Twin ever did and not have to combo at all. I wouldn’t mind trying to squeeze a Vendilion Clique and maybe another Lightning Helix in to try and play the tempo game, but I understand where this list is going in terms of value. Play some games with Spreading Seas before you cut it, but depending on how strong it is against the field that’s probably the first change I would make. We all knew Fatal Push would be good—what I’m excited for here is the power it provides to decks not playing Lightning Bolt and Terminate. Upgrading our Terminate is nothing to laugh at by any means, but it’s fairly minor when compared to the value gained from upgrading from Dismember. The question on my mind remains, as it has for as long as I can remember: “why are we not playing Jund”? The answer, for now, lies in our manabase. Traditionally, straight BG decks took a hit in terms of power level in exchange for smoother mana, fewer tapped lands and the ability to play Treetop Village. This really helped in the Burn department, but you can argue for Jund being better against Affinity because Kolaghan’s Command is still the absolute nuts. Courser of Kruphix is a fine value card if the metagame lines up correctly for it, and there are numerous other small differences, but for the most part that’s the line these two decks draw in the sand. More power, or more consistency? Fatal Push just dove headfirst over that line. We are reaching the point where BG isn’t losing out on much compared to Jund, and that’s definitely an interesting place to be. Now, the question of “which BGx midrange deck should I play” comes down almost entirely to sideboard decisions and minor metagame shifts, rather than just stubborn refusal not to play Jund, the widely accepted “best version.” It’s still a little early to pass judgment, but if printing another powerful black removal spell results in more diversity among the black decks, then color me impressed. Just a quick look at the recent top-performing decks shows old archetypes made better and new archetypes made possible, thanks in large part to Aether Revolt. Yes, Dredge and Infect getting the cut is more responsible for making these results happen, but without Aether Revolt we would just be rewinding time to a period long ago when Dredge was banned before (you know, like a year). We’re still barely baby steps into this new format, but Modern is looking better than ever. I sent you guys a very thorough article on my sultai midrange deck that I narrowly missed too 8 with at regionals out of 236. This is a good article. I like figuring out what decks will be up and coming with additions to the card pool. I think that I would go the opposite direction than what you had mentioned when it comes to the Saheeli deck, though – embrace the fact that you are a sorcery speed value deck with a combo stapled on, and employ spells that further the gameplan. That means more Walls, more Seas, and really trying to shoot for ending the game on Turn 4. I also think that wanting to cast anything that’s not a Felidar at the 4-spot or a Saheeli at the 3-spot is a mistake. I actually happened to face this list online (I won), and it didn’t quite feel tuned to me. The BG Rock deck also needs to embrace what makes BGx so successful – big, efficient threats. I don’t see much reason to not opt for a Bob/Goyf/Flayer/4-drop of choice lineup. Fatal Push is not that scary to a deck that has access to so much discard, and being able to pressure the opponent efficiently early is going to win a lot of games. The Sword being mainboard also makes literally no sense to me – Kolaghan’s Command is a prominent player in the format, and that means clunky artifacts have to be sideboarded in. Why no Leyline of Anticipation in Saheeli? That instant speed combo would be nuts since you can use it to also hold up counterspell/snap-bolt mana, and instant speed spreading seas/serum visions sounds like it would feel SO good. It hurst the deck consistency a lot since it pretty bad in multiples and tapping out at turn 4 (if it don’t come on your starting hand) to do “nothing” is not a very good plan. I would like to be slightly huffy and pedantic about my deck being called “mini-eggs”. Seems to me that the format is at the beginning of a major shake-up, which is good news as far as I’m concerned. Wish Wizards hadn’t chosen to de-empahsize Modern, though, as their announcement indicates. I don’t think it is a de-emphasis of modern so much as a re-emphasis of standard. Hard to blame them, standard and limited are the formats that actually drive sales of things other than modern masters. WOTC has a little too much respect for investors, large vendors, and the secondary market. Ultimately, if you are worried about the state of modern, your best bet is to be a driving force in your local area. Encourage players to try modern, and constantly suggest your local game stores hold modern events. This format doesn’t have the dark cloud of a reserved list floating around its head like legacy. And WOTC isn’t dumb, consistent modern popularity at lower levels will keep it going at higher levels too, specifically with print runs of future masters sets. 6 mana to combo with Jeskai. And I think paradise mantle requires no summon sickness right? I feel like Saheeli has no place in Modern. If you want to play that kind of deck, it feels just better to play Kiki/Resto + value blink/control package. Even UR Kiki/Pestermite/Blood Moon seems better. This combo will probably rock Standard for a while, but I think it’s too clunky and the pieces are too bad on their own to really take off in Modern. I think the main advantage of the Saheeli Cat to Splinter Twin is that you can play either cards, rather than needing one to get another. So you can play either for value early and then threat the combo every turn.